Most high-end compact cameras and all D-SLRs will let you shoot RAW and JPEG files at the same time, and there are some good reason for doing this. You might want a JPEG straight away for posting online, for example, or for sending to other people, then use the RAW version for your proper image-editing work. It’s also instructive to compare both in programs like Aperture and Lightroom, because although the RAW file is technically superior, you may find the JPEG is more accurate or more vibrant because the processing has been optimised by the camera maker according to the strengths or weaknesses of the camera or the particular settings you’ve chosen. RAW files can usually be made better, but the default conversion’s ‘look’ is often worse until you do some work on it. Note, too, that if you’ve used a Picture Control (Nikon) or Picture Style (Canon), this will be visible in the JPEG but ignored by third-party RAW converters – you’ll have to replicate the style manually. So shooting RAW+JPEG files is often a good idea – but then you have to decide how you want Aperture or Lightroom to handle them. And these two programs have two different approaches, even though they look the same to start with. Today I’ll look at how Aperture handles RAW+JPEG pairs, and tomorrow I’ll explain how Lightroom does it. Both programs try to be helpful by combining them into a single entry in the library, but that’s not always what you want, especially if you want to view and edit them individually. 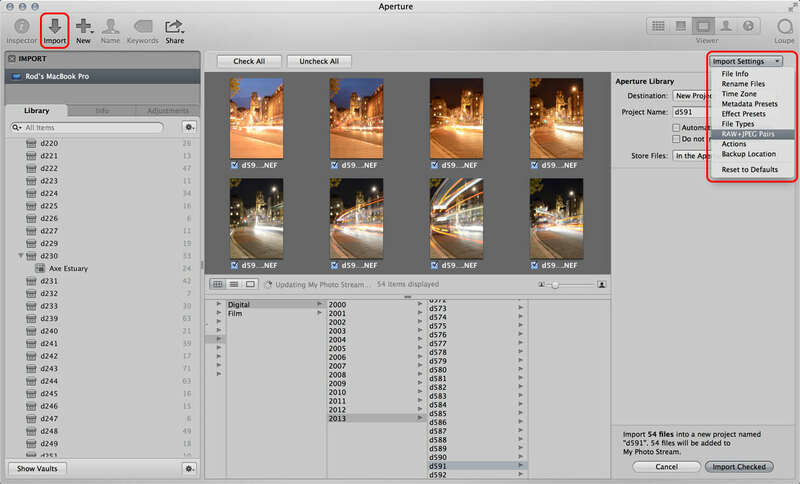 There are two ways to import photos into Aperture. The one I prefer is the File > Import > Folders as Projects command. I prefer this because I often sort through my images first, and this option preserves the folder structures and names I’ve created. This dialog displays RAW+JPEG options at the bottom as a pop-up menu. 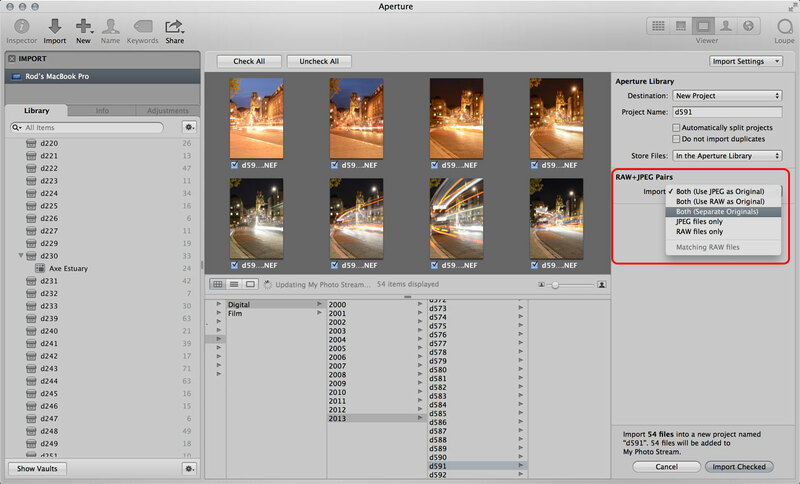 By default, Aperture will import both but combine them as a single image within your library. If you want them to be imported as separate images, you need to select the ‘Both (Separate Images)’ option. This displays an ‘Import’ panel which offers the same options as Step 01. 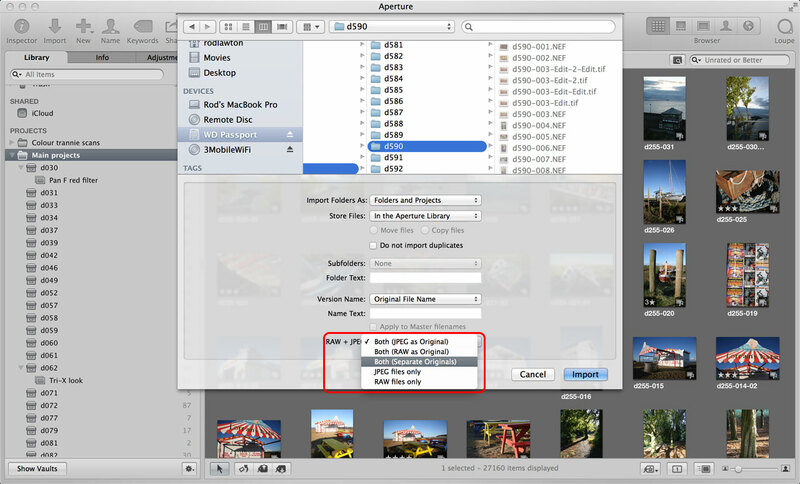 Again, you can choose to have the RAW+JPEG pairs combined as a single image or import them as separate items. Nice post. I am an amateur and have been shooting Raw exclusively with my DSLR. Recently, though, I’ve read posts elsewhere advocating switching to JPEG as the primary format. I am not ready to give up Raw yet, so posts like this one help in managing the workflow when adding JPEG pictures to the mix. I plan to try shooting Raw+JPEG for a while to see the results. By the way, I understand that one way to separate the Raw+JPEG pairs in the Aperture library is to export them with the metadata and then re-import them separately. I haven’t tried this so don’t know how well it works. It’s been a while since I’ve worked with RAW + JPEG pairs, so the feature is not fresh in my memory, but the issue I remember having was in being able to delete only the RAW part to a pair (I only wanted to keep the RAW version of my better photos). A year ago at least, I couldn’t find a way to do this within Aperture, and deleting the RAW version via Finder seemed a bit messy (not to mention harder to browse & identify the ones I wanted to delete). The same would apply if you wanted to delete the JPG version for some reason. My library is now bigger than my internal HDD so I’ve switched to referenced files and I relocate archived projects to a secondary HDD so I don’t need to worry so much about shooting & keeping RAWs for ever photo. If Apple made this possible in a future update I could be tempted to go back to pairs. I don’t need RAW for everything.